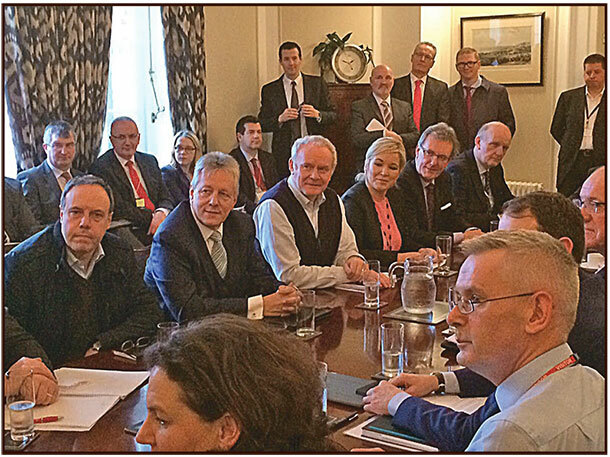 ON Monday 29 December, the Sinn Féin Ard Chomhairle met in Dublin to discuss the recommendation from the party’s negotiations team that the Stormont House Agreement concluded in Belfast on 23 December (“the Eve of Christmas Eve”, as the media called it) be ratified by the national leadership. It was a very detailed discussion on the context to the talks and their outcome. Sinn Féin entered these talks some 12 weeks ago to reach a comprehensive agreement on the political and financial challenges arising from the continued undermining of previous commitments since the Good Friday Agreement and also this British Conservative government’s attempts to impose catastrophic cutbacks on social welfare for the most disadvantaged in the North. The Agreement made very important progress with regard to protecting the most vulnerable and delivering additional investment to the regional Northern economy. Important headway was also made in relation to dealing with the legacy of the past conflict; contentious parades; and flags, symbols and cultural identity. However, the Agreement reached fell short of being comprehensive because the British Government refused to meet its obligations to hold an inquiry into the killing of lawyer Pat Finucane, legislate for an Irish Language Act or a Bill of Rights, or address other outstanding commitments. Disgracefully, the Irish Government supported British intransigence on these positions. It did so despite its co-equal responsibility for guaranteeing implementation of all previous agreements, and ignoring the advice of both Sinn Féin and the SDLP. Instead of standing alongside Northern nationalists and republicans, the Irish Government allowed its annoyance and political opposition to the growth of Sinn Féin across the island to dictate its approach towards the talks since October and the negotiation itself, which finally began on 17 December. The clear evidence of that was revealed when both British Prime Minister David Cameron and An Taoiseach Enda Kenny arrived in Belfast on Thursday 11 December. What occurred then was the worst form of car-crash diplomacy, with Cameron in the driving seat and Enda Kenny as his front-seat passenger. After nearly ten weeks of talks, which at no stage had ever developed into real negotiations, the two leaders arrived to table a joint paper. Ironically, this could have potentially been the start of a negotiation but that was never the two governments’ intention. Since late November, Sinn Féin had said all the indications pointed towards the ground being prepared for a predetermined British document with an Irish Government sign-off. 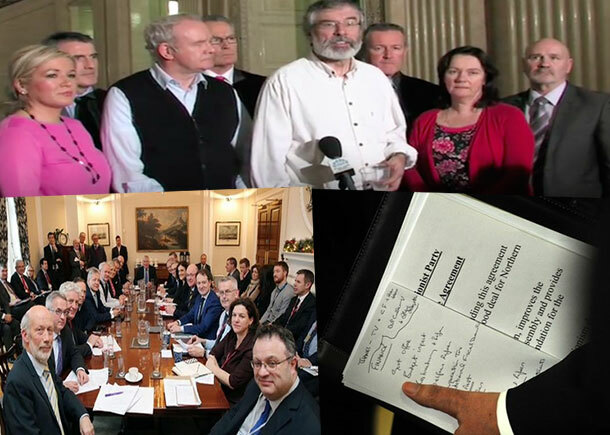 It was apparent for some time that a ‘take it or leave it’ paper was being drafted, the core of which would include the imposition of welfare cuts; increased austerity; fewer Executive departments and fewer MLAs; as well as dilution of Haass compromise proposals on the past, parades and cultural identity; and no movement on outstanding issues from the Good Friday Agreement and other agreements. Sinn Féin told Irish Government Minister Seán Sherlock and his key officials immediately before An Taoiseach came that a potential moment of opportunity did exist and that a comprehensive talks outcome should not be squandered with a setback. They were reminded that wider community and republican confidence in the political process had been undermined and that national leadership was required from the Irish Government. Power-sharing, equality, the all-Ireland agenda, adherence to the Haass proposals, Irish Language Act (Acht na Gaeilge), Pat Finucane inquiry, and Maze/Long Kesh project were all set out as necessary and reasonable requirements – that is, they are already agreed. These issues were and have been a litmus test of the Irish Government’s determination to ensure the advance of national and democratic positions mandated in referendum: the British sought primacy for its own and unionism’s agenda. The original joint paper on 11 December, agreed to by the Irish Government, supported the latter. By doing so it signed up to becoming a cheerleader for British Conservative austerity in the North and the rolling back of the Good Friday Agreement. 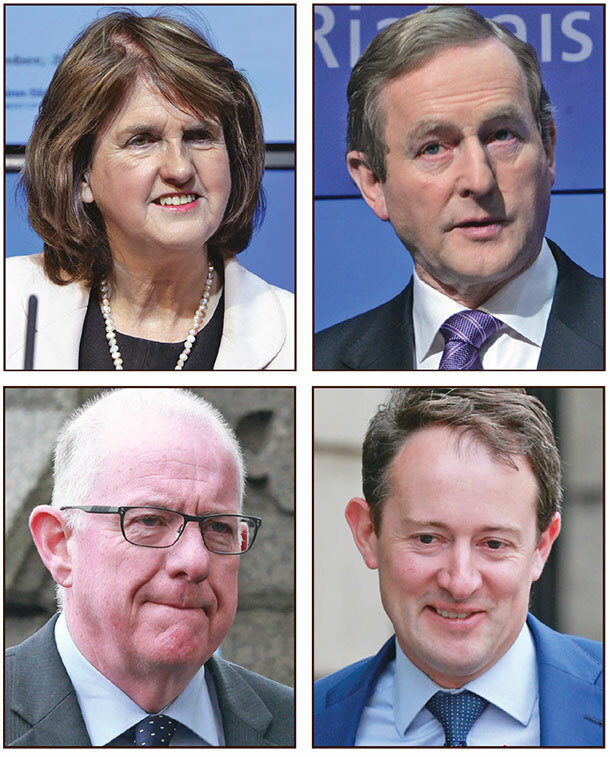 The Haass proposals last year offered a road map for political stability. Had the British Government and unionism agreed then, we would have been able to tackle our economic challenges from a better position. At that time, Sinn Féin compromised on all our positions regarding the past, parades, and identity and flags. So too did the SDLP and the Alliance Party. One year on, the two governments’ paper decided that unionist rejection of the Haass proposals and compliance with British Conservative Party austerity policies should be its starting point. Their paper was aimed at getting Sinn Féin to compromise again on the very compromises which the party had already made during the Haass talks as a means to encourage unionism to ‘perhaps’ begin compromising. The two governments’ joint strategy was about trying to jump-start a phony negotiation, in reverse gear. It did not work. So David Cameron walked out and went home on Friday 12 December. Given this British administration’s track record, that type of stroke was no surprise. Its focus is the Westminster elections this May and trying to keep the Democratic Unionist Party sweet. But it was a disgrace for any Irish Government to play fast and loose with the political process. The united position which the Irish Government adopted with the British meant it turned away from its commitments to the Barron Inquiry requirements on the Monaghan and Dublin bombings, the Pat Finucane inquiry, and the Ballymurphy Massacre independent panel. That paper – which the Irish Government jointly authored – accepted the primacy of British national security interests over truth for Irish citizens. The politics of this period have been eerily similar to the mid-1990s when the British Conservatives and Fine Gael were also in power. Only when Sinn Féin said categorically that the mid-December joint paper was totally unacceptable, and a realisation dawned that the political situation had been made worse by the two governments’ actions, did a real negotiation commence on Wednesday 17 December. The Irish Government was complicit in drafting a paper which represented a setback for Irish national and democratic interests, fundamentally compromising the rights of Irish citizens in the North, and breaking faith with the integrity of the Good Friday, Weston Park, St Andrew’s and Hillsborough Castle Agreements. It effectively sought to nationalise austerity by supporting the British Conservatives’ efforts to hurt the most weak and vulnerable in the North. That is the context against which Sinn Féin and others had to negotiate. 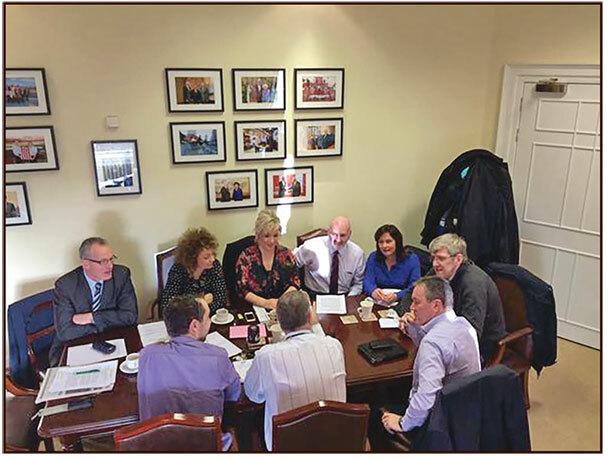 Having been previously passive and semi-detached towards the North, this Fine Gael and Irish Labour Party coalition government’s new-found focus showed a reckless indifference towards the fate of the political process, and all because of their selfish electoral interests in the 26 Counties. That narrow electoral agenda continued to dictate its approach to the negotiations which took place between Wednesday 17 December and Tuesday 22 December. Sinn Féin negotiated hard to stop the exclusion by the British – with Irish Government acquiescence – of fundamental positions in the final “Heads of Agreement”, including issues such as coroners’ courts, so important to families seeking truth and justice for their loved ones. As a consequence of Sinn Féin’s work, supported by the SDLP, the Haass compromise proposals opposed last year by unionists and the British will now be implemented. The Parades Commission will continue. British national security interests will not be allowed to put a dead hand over the quest for truth and justice. Coroners’ courts will be protected. No welfare benefits under the control of the North’s Executive will be reduced. A Civic Forum will be established. Reforms to the political institutions will be introduced. Progress on securing the Pat Finucane inquiry, the Irish Language Act, the Bill of Rights, and other outstanding matters could have been made had the Irish Government done the right thing and stood up for Irish national and democratic interests. These issues and other campaigns must now be taken forward with renewed momentum by all strands of national, democratic and progressive opinion, and by Irish America. The success and stability of peace and political processes in the North are paramount. They are bigger than the Irish Government, individual parties, or any narrow political agendas. They should never be subjugated to electoral self-interest. It is an absolute, national disgrace that this particular Irish Government chose to do just that. 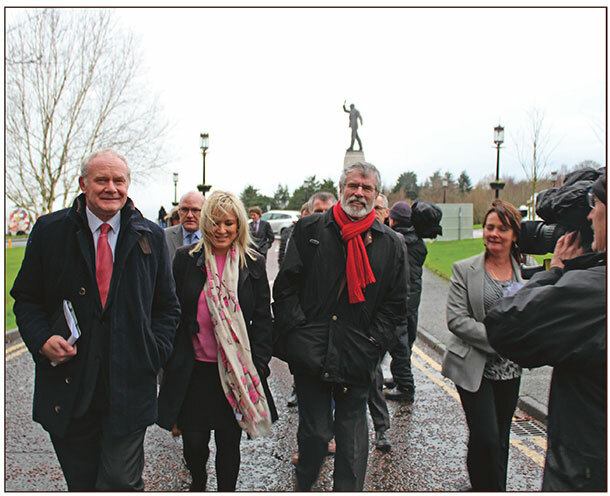 The last period of political instability has confirmed what Sinn Féin warned about for years – that the Peace Process must not be taken for granted. No Irish government should ever be let play partisan politics with the Peace Process again. 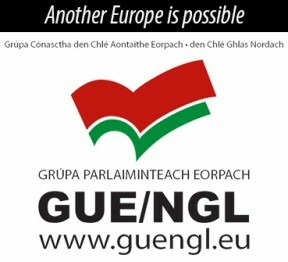 What has happened underscores the importance of harnessing the increased European Parliament influence, which it has offered; and a more intensive engagement in the process by the British Labour Party. A continued involvement by the United States administration remains vital. The political expertise of Senator Gary Hart (Secretary of State John Kerry’s appointed envoy) was not utilised in this negotiation by the two governments. There is an essential role now for him to encourage full compliance with the implementation of the Stormont House Agreement. If all sides are prepared to embrace the potential contained within the Agreement, including both governments, it can serve as a road map for restoring political stability to the democratic process and political institutions in the North. It will assist in remodeling the regional economy whilst protecting the most vulnerable. This Agreement, if implemented, can also be a catalyst for encouraging greater participation in democratic politics, opening a new phase of the Peace Process, and the emergence of authentic reconciliation at last.